Hi! 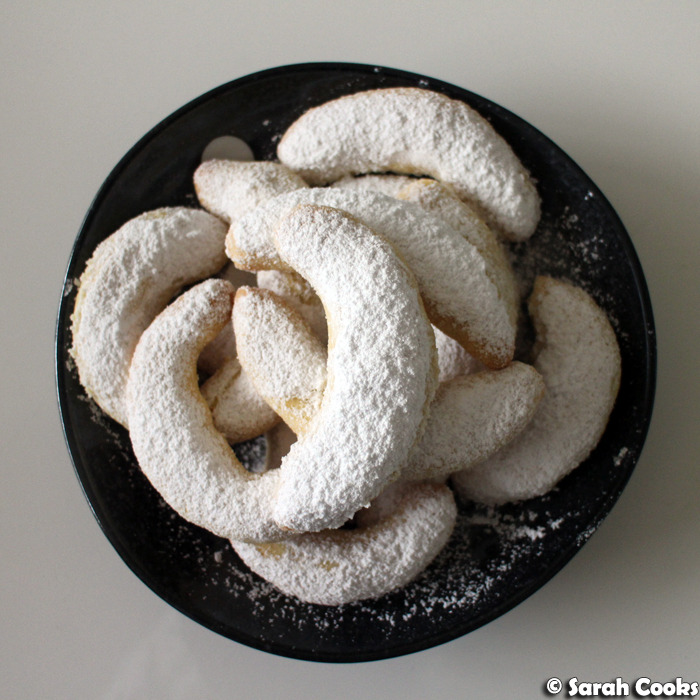 I've got another Christmas biscuit recipe for you today - my beloved Vanillekipferl! In my household, baking a batch of Vanillekipferl signifies the start of the Christmas season. 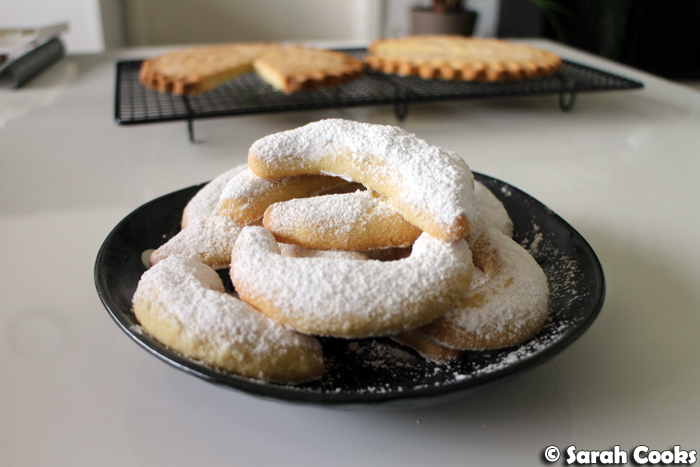 (Indeed, these Vanillekipferl were baked on the same day I baked the shortbread). So much Christmas cheer! I'm generally not a fan of traditional German Christmas cookies (Weihnachtsgebäck) like Lebkuchen, Zimtsterne, and the generic Butterplätzchen, finding them sweet, overly spiced and a little dry*, but for Vanillekipferl I have always had an unreserved passion. I mean, what's not to like about crumbly buttery shortbreads, rich with almond meal, and fragrant with vanilla? I've posted a recipe for Vanillekipferl previously, but this year we've changed the recipe we're using, and I thought you might like to give it a go too. 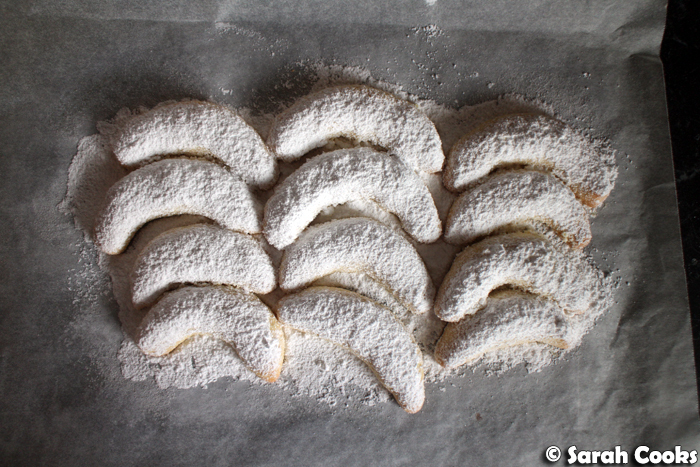 The recipe is from Dr. Oetker, and appears in their books Backen Macht Freude and Plätzchen von A-Z. The old recipe we used was simply flour, butter, almonds, sugar and vanilla, but the new one also has egg yolks in it, for extra richness. I find these crisp and delicious, with a slightly moist centre, redolent with almonds. So delicious! I hope you like these! If you like the look of this recipe, you might also like my recipes for Mexican Wedding Cakes, Shortbread Biscuits or Classic Shortbread Wedges. How are your plans for Christmas? Do you like to celebrate, or just chill out? We've done a little decorating (see my most recent Christmas post), had one turkey-and-Christmas-pudding lunch already, with another, smaller Christmas lunch planned for this weekend. Hooray! Add the sugar, vanilla sugar (or extract), egg yolks, butter and almonds. Mix (by hand or with an electric mixer), until the ingredients are smoothly combined. Cover with clingwrap and chill the dough until firm. 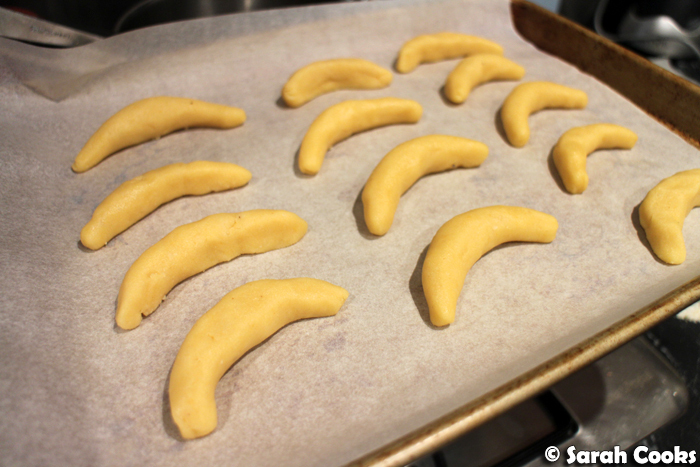 Take tablespoons of the dough and form into crescent shapes. (The dough expands in the oven, so you can afford to make them thin rather than thick). Place the biscuits on the prepared tray. Bake for 8-10 minutes or until lightly golden. Mix the 50 grams icing sugar with the extra vanilla sugar. Dust the biscuits heavily with the icing sugar mixture while still hot. *It is entirely possible that I think I don't like Weihnachtsgebäck simply because I haven't tried a good version. If you have any recommendations for good recipes or brands to purchase, please hit me up in the comments! Icing sugar is the closest we ever get to a sensation of snow during a Christmas down under! And I used to love lebkuchen as a kid but now I do find them on the sweet side. Nothing a cuppa tea can't fix!